Do you know if your partner is marriage minded or not? Putting yourself out there to meet marriage-minded singles can seem like a lot of work. Also, dating people you meet from online dating may be scary to you. Just remember, you are making all this effort because you believe you can find true love online and that before long you are going to meet that special someone. I’m here to tell you, yes, it does happen. 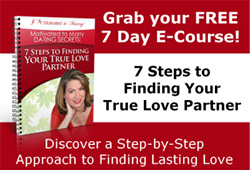 Over two thirds of my successful clients have met their marriage partners through online dating. And yet, how can you tell when it is happening to you? What are the signs that he or she is The Right One?